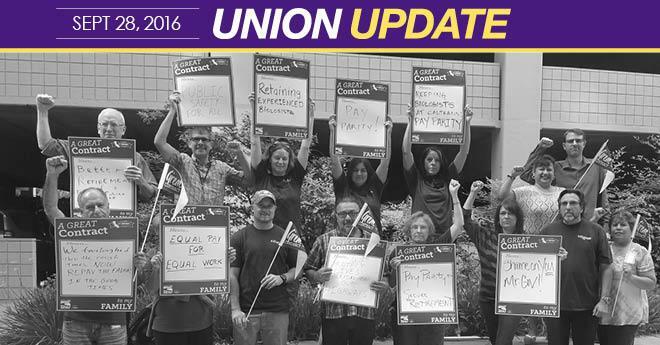 Our bargaining team returns to the table Oct. 10 to press the state for a response to our demand for dignity and respect in the form of a pay increase that recognizes the value of our work and the vital contributions our members make to California. Every week, up and down the state, our members are taking action in growing numbers to demonstrate our resolve to win a contract we can all be proud of. Thousands have taken the pledge to support our bargaining team and participate in all Local 1000-authorized actions. “Now, more than ever, we must continue to stand up and stand together to win,” said Yvonne R. Walker, Local 1000 president. Negotiations reached a crossroads in June when the state offered a pay increase of less than three percent a year in an era when California has the sixth largest economy in the world—including a budget surplus— while our members are still recovering from a painful furlough era. We held town halls across the state and heard directly from members that the state’s offer does not value the work that we do. So far we’ve reached tentative agreements on dozens of contract articles that advance our rights by creating better working conditions, healthier and safer workplaces, and improving professional opportunities. But we’re not finished yet. And we’ll keep taking action until we win a contract we can all be proud of. Together we are Unstoppable.